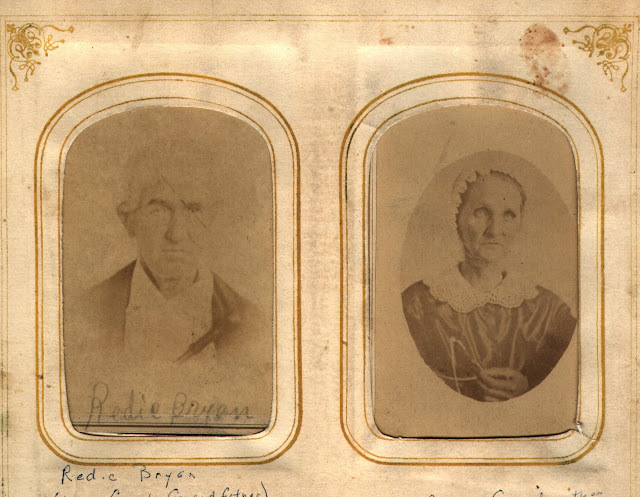 These photographs of Reddick and Elizabeth Regan Bryan can be seen in more than 100 Public Family Trees at Ancestry.com and at countless web pages on the Internet. The original photos are in a family Bible that belonged to Terrell Bryan, son of Reddick and Elizabeth, and is currently in my possession. Look closely at the photographs - Reddick is holding a crop of some kind and Elizabeth is holding glasses. Duplicates of this can be had at any time. These are CDVs (Cartes de visite), not tintypes, which were widely available in the United States by 1859. I know that one other Bryan descendant has original copies of these photographs and it would be interesting to know if others have survived. Imagine how surprised Reddick and Elizabeth would be to know that these have been copied by hundreds of persons and viewed by thousands around the world.